The current PL (public land) zoning for some of the properties is a vestige of the AAHC properties’ status as city-owned land. The city council approved the transfer of deeds to the AAHC at its June 2, 2013 meeting. The three sites given final rezoning approval on July 7 are part of the housing commission’s major initiative to upgrade the city’s public housing units by seeking private investors through low-income housing tax credits. AAHC director Jennifer Hall has explained that PL zoning doesn’t allow housing to be built on a parcel. As AAHC seeks private funding to rehab its properties, it needs to ensure if a building burns down, for example, it could be rebuilt. In general that’s why the rezoning is being requested. It’s also being requested to align the zoning with the current uses of the property. The highest priority properties to be rezoned are Baker Commons, Green/Baxter and Maple Meadows, because investors have already been found to renovate those sites. In a related action on July 7, the council gave initial approval for rezoning an AAHC site on North Maple. The rezoning is for a 4.8-acre site at 701 N. Maple Road – from R1C (single-family dwelling district) to R4B (multi-family dwelling district). The planning commission had recommended the rezoning at its June 17, 2014 meeting after postponing it on June 3, 2014. The site plan calls for demolishing 20 existing single-family homes – the public housing complex known as North Maple Estates – and constructing an eight-building, 42-unit apartment complex with a total of 138 bedrooms. The units range in size from one bedroom to five bedrooms. The project would include a playground, community building and 73 parking spaces. According to a staff memo, the buildings would be located along a T-shaped driveway that connects to North Maple Road and Dexter Avenue. The drive extends northward toward Vine Court but does not connect with that street. There would be a new connection to Dexter Avenue through the remaining, undeveloped length of Seybold Drive. The project will require the city to vacate a portion of the right-of-way for Seybold Drive. The surrounding land is owned by the housing commission, so if the right-of-way vacation is approved, the land would become part of the housing commission property. The site plan was not in front of the city council on July 7. Only the initial rezoning approval and a resolution of intent to vacate right-of-way for Seybold Drive appeared on the agenda. That resolution of intent set a public hearing for Aug. 18, 2014 – the same council meeting when a vote will be taken on the vacation’s approval. The rezoning will also need a second vote of approval from the council at a future meeting. According to the staff memo, after the planning commission’s June 3 meeting, the city’s traffic engineer reviewed the proposed new connection from Seybold Drive onto Dexter Avenue, and concluded that sight distances from all approaches are acceptable. He suggested that the pavement markings on Dexter should be refreshed. The reconstruction of North Maple Estates is also part of the ongoing effort by the housing commission to upgrade the city’s housing stock for low-income residents. At the planning commission’s May 6, 2014 meeting, AAHC executive director Jennifer Hall had made a presentation about the initiative, which includes seeking private investors through low-income housing tax credits. 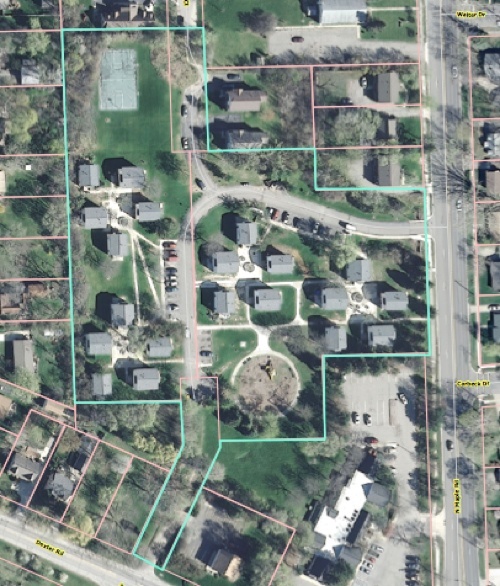 Also at its July 7 meeting, the council confirmed the appointment of Audrey Wojtkowiak to the board of the Ann Arbor Housing Commission, to fill the vacancy left by Christopher Geer. Wojtkowiak’s nomination was made at the council’s June 16 meeting. She’s controller for the Consolidation Center at Detroit Diesel.